Mumbai Candid: Jack & Jones, Vero Moda & Only Super Sale! Chandni !! thx for the heads-up on the sale fiasco. 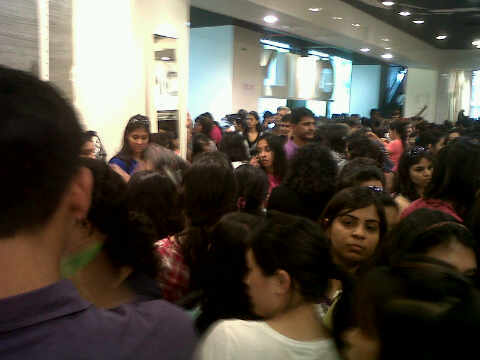 Was sensible enough to stay away when I read the comments on Vero Moda FB page about the 2 hr queues. It just makes more sense to go and buy when they have their annual sales. Its spread over weeks and at the end one does get 70% off also on some items. Actually I went for the sale, I reached there at 10 and was in the first 'lot' that was allowed to go in..
Sure there was a rush and a 'small' line..
And there were really really good things too!! I picked a J&J shirt for my bf (1995), a lace tube dress in cream (1345), a white printed tee (445), a black blazer jacket (3295) a shirt style tunic (1545), a satin silk ganji with buttons in front (1145) and lastly a pair of dark grey jeans with a few shreds (3295).. My total was 13065 and with the discount I paid 5226 for 7 items! Including jeans and a party dress and a blazer.. I think it was a really good bargain..
Oh and one more thing.. I heard that they were re-stocking at 3pm..
Don't kno if its true however.. Funny thing is, I went again at 8 30pm, just for fun sakes. I was initially supposed to go with a colleague after work, but we went before instead, so we wanted to see how it would have been like if we stuck to our original plan.. It was still a little crowded, however lesser than the morning, but the check out was a lot bigger than earlier, and most clothes looked 'almost damaged' tags ripped off and some were on the floor and people were stepping over them!